To reduce the odds of all-out war with the Soviet Union, President Truman called the Korean War a “police action,” but to the soldiers who fought, this proxy war was still war. Meet some of the men from our area who served. U.S. Marines watch as UN aircraft bomb enemy troops during the Chosin Reservoir campaign. Editor’s Note: Place names used during the war originated from Japanese maps. Korean spelling is shown in brackets. The fledgling United Nations failed to accomplish this task, as two Korean governments emerged and fought a bitter civil war for control of the country, a war which killed more than 100,000 Koreans. Soviet forces withdrew from North Korea in 1948, leaving behind a communist dictatorship and a large, well-equipped army. The U.S. left South Korea in 1949, leaving behind a shaky democracy and a war-weary army that was undertrained, underequipped and outnumbered by the North. With Stalin’s permission and backing, on Sunday, June 25, 1950, between 150,000 and 200,000 soldiers of the North Korean People’s Army (NKPA) invaded the South. About a third were veterans of the Chinese Civil War (1945-49), and they swept the Republic of Korea (ROK) forces aside. American troops from Japan and the U.S., suffering from post-war disarmament reductions, were quickly sent to Korea that year, but were unable to stem the rout until they established a “stand or die” defense perimeter around the southeastern port of Pusan [Busan] in August. Truman tasked World War II veteran General Douglas MacArthur with leading U.N. military operations, and in September he turned the tide of battle with a risky, surprise amphibious landing at Inchon [Incheon], near Seoul, the South Korean capital. With their supply lines cut, the North Korean forces were pushed back by a U.N. breakout at Pusan. By the end of the month, U.N. forces were crossing the 38th parallel into North Korea. MacArthur saw the total defeat and occupation of North Korea as a prerequisite to unifying the country, and wished to push on to the Chinese/Russian border at the Yalu River. Both Washington officials and MacArthur ignored warnings that this strategy could prompt a Chinese intervention. In mid-October, again with Stalin’s support, 200,000 communist Chinese troops secretly crossed the Yalu River. Marching dusk to dawn and using aerial camouflage during daylight, the Chinese entered Korea completely undetected by U.S intelligence units. To enforce strict discipline, Chinese officers were instructed to shoot any soldiers who moved while U.N. aircraft were flying above. This influx of “unlimited” manpower and Soviet weapons pushed U.N. forces south across the 38th parallel, sometimes in headlong retreat. By January, 1951, the communist forces had reached their high-water mark near Wonju, in South Korea. A series of attacks and counterattacks pushed the front lines back and forth until things stabilized near the initial frontier at the 38th parallel, by mid-1951. MacArthur’s “all or nothing” strategy for winning the war included bringing in the Nationalist Chinese forces – the recent enemy of Red China during the China’s civil war, which had retreated to Formosa (now Taiwan). His strategy also called for bombing bases in China and even using nuclear weapons, if necessary. When MacArthur made public his passionate objection to Truman’s policy of containment and limited war, which he believed to be immoral, Truman fired him for insubordination. Truce talks to end the fighting started in July, 1951, as each side began to admit it was unable to force its form of Korean unification on the other. Still, the fighting continued for another two years, adding such iconic names as Bloody Ridge, the Punchbowl, and Porkchop Hill to the lexicon of U.S. military history. Truce talks stalled over several issues, including the voluntary repatriation of prisoners of war (POWs). The U.N. wanted prisoners to decide for themselves whether to stay in South Korea or return to their country of origin in North Korea or China, or go to Nationalist China; the Chinese wanted them forced to return home. In one of the greatest tragedies of the war, this stalemate cost another 125,000 U.N. casualties by war’s end. An armistice (which is not a peace treaty, but a mutually agreed upon cease fire) was signed on July 27, 1953, three years, one month and two days after the North Korean invasion. POWs were allowed to choose their return destination. Belvidere resident Charles Gebhardt, 83, enlisted in the U.S. Army in 1949, and was sent to Korea in July, 1950, about a month after the North Korean invasion. He served in the operations section (S-3), first with the 29th Infantry Regiment during the defense of the Pusan perimeter, then with the 32nd Regiment, during the September invasion of Inchon. In mid-October of 1950, after crossing the 38th parallel into North Korea, Gebhardt’s regiment was ordered back to Pusan in preparation for another amphibious landing, this time on the east coast of North Korea, at Iwon. Gebhardt’s unit, now designated the 31st Regimental Combat Team (RCT), was transported to an area east of the Chosin [Changjin] Reservoir to relieve a Marine unit which was trying to rejoin the rest of its division on the west side of the frozen lake. 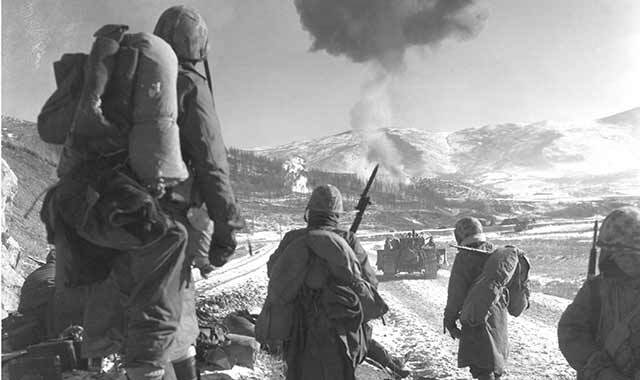 On Nov. 27, Gebhardt’s battalion, the 32nd, paused in its advance to bivouac at Sinhung-ni, an abandoned village about halfway up Chosin’s eastern shore. A hasty perimeter was set up, since plans called for attacking toward Kanggye and moving on to the Yalu River the next morning. In what became a familiar Chinese tactic, the enemy forces withdrew into the hills as daylight approached. The soldiers were attacked again the next two days, and Col. MacLean was killed. Lt. Col. Don Faith assumed command of the remaining units, now renamed Task Force Faith. He ordered a withdrawal to the south, in order to link up with other remnants of the regiment. Expendable supplies and equipment were destroyed to deny the enemy their use, and to make room in the trucks for the considerable number of wounded. With knee-deep snow, nightly temperatures at 30 below zero, and cruel winds blowing out of Manchuria, the dead could not be buried in the frozen ground, and the trucks had no room, so they were left behind. Roadblocks of debris or blown bridges, manned by enemy machine guns, frequently brought the road-bound convoy to a halt until they could be cleared. A Marine forward observer on the ground was able to contact planes to parachute supplies of ammunition, but those supplies often fell among the Chinese, recalls Gebhardt. Corsair fighter-bombers strafed and bombed the Chinese hilltop positions and roadblocks with napalm. Gebhardt and other stragglers finally reached the Marine encampment at Hagaru-ri, where a colonel became upset that they had abandoned their wounded. Gebhardt and the officer rounded up 46 volunteers and several trucks, then drove 2 miles from the shoreline, across the ice, back to the deserted convoy. For his bravery under fire, Gebhardt was later awarded the Distinguished Service Cross, an award second only to the Medal of Honor. On Dec. 4, he was evacuated from Koto-ri to Tokyo with suspected pneumonia, which turned out to be the flu. The 31st RCT was nominated to receive the Presidential Unit Citation for its role in delaying the Chinese advance, but red tape, politics or a lack of information prevented it until 2000. When Rockford resident George Graham, 67, was about 8 years old, he learned that his uncle, Johnny Calvin Graham, had been killed in action in Korea in December of 1950. At the time of his death, Johnny was a member of Co. C, 1st Battalion, 32nd Infantry Regiment, 7th Division, US Army. No details about how or where Johnny died were provided to his family. His body was never recovered, so the family was left to speculate on what happened. In 1999, Graham posted an inquiry regarding his uncle on the website for The Chosin Few, a Marine Corps veterans’ organization of survivors from the Chosin Reservoir campaign. Responses to his posting began almost immediately, leading Graham to contact Col. John Edward Gray, U.S. Army, retired. Gray was part of the 31st RCT – Task Force Faith – when it attempted to break through the surrounding Chinese forces near the Chosin Reservoir. Gray was severely wounded during the battle, and had witnessed the same Dec. 2, 1950 friendly fire incident as Charles Gebhardt had – in which American soldiers were killed by a napalm strike. After putting together the documents, correspondence, maps and other information he had accumulated about his uncle for 16 years, together with what he learned from Col. Gray, Graham concluded Johnny Calvin Graham was a victim of that napalm incident. Gray wrote a book, published in 2006, titled Called to Honor: Memoirs of a Three-War Veteran, in which he describes in agonizing detail the struggles and sacrifices experienced by Task Force Faith during its five-day ordeal along the frozen Chosin. According to Gray, the 31st RCT started the campaign with 3,155 men. By the time it reached the relative safety of the coast, more than 1,000 of its men had been killed in action (KIA), 200 were missing in action (MIA), and 1,550 had been wounded multiple times. This left only 385 combat-ready soldiers. Later records revealed they had been attacked by two full Chinese divisions of about 20,000 men. According to the Korean War Project, the US military currently has the unidentified remains of about 1,000 soldiers killed in the Korean War, and has located the sites of another 2,000 still in North Korea. The Department of Defense POW/MIA Accounting Agency in Hawaii lists 7,846 MIAs unaccounted for in Korea. Since 1982, they have identified 311 remains using DNA samples from family members. Members of Graham’s family have submitted such samples to the DoD in the hope that Johnny’s remains will someday be located and sent home for burial in the family plot in Missouri. Since Graham’s research finally explained his uncle’s death, other family members have entrusted him with their wartime memories. For the past five years, he has worked with the Makin County Historical Society near his hometown in Missouri to create a military history room. It is filled with portraits, uniforms, and other memorabilia from area families whose members served in various wars. “Someone from my family has participated in just about every war this country fought,” says Graham. Graham met Charles Gebhardt through their common membership in Chapter 272 of the Korean War Veterans’ Association, which meets monthly in Loves Park, and learned of Gebhardt’s actions during the Chosin Reservoir Campaign. Rockford resident John Ciburk, 87, was trained as a mechanic in the U.S. Air Force, and became a flight engineer for B-29 bombers in 1949. The B-29 was the four-engine Superfortress that devastated Japan during World War II, including dropping the first atomic bombs on Hiroshima and Nagasaki. In 1950, his unit, the 343rd Bomb Squadron, 98th Bomb Group, was scheduled to be deployed to Puerto Rico, but the Korean War intervened. Within a week, Ciburk and his 10-man crew were bombing targets in North and South Korea. A typical mission from Yokota lasted eight to 10 hours and the plane carried 20,000 pounds of high explosives. Targets varied, from bombing strategic oil refineries to destroying roads, bridges, and troop concentrations. As flight engineer, Ciburk was in charge of pre-flight inspections, which required him to be at the aircraft at least two hours before take-off. Consequently, he never attended the pre-flight briefings with the rest of the crew. Ciburk flew 43 missions over Korea, from July of 1950 to July of 1951, all but one in daylight. Most of Ciburk’s flights were aboard the aircraft “Miss Fortune II,” so nicknamed by the pilot, Henry Aschenfield. Around his 15th mission, Ciburk and crew had an exciting misadventure. While climbing through cloud cover after take-off, first one, then a second engine caught fire. Nothing Ciburk could do would put out the fires. The front escape hatch was near Ciburk’s position in the aircraft, so half the crew exited there. The rest went through another doorway in the rear. Besides sweating whether his chute would open, Ciburk also worried about landing in the water. “I can’t swim,” he admits. Fortunately, the whole crew landed safely, although one man broke his foot upon landing. Although scattered for about a mile, the men soon gathered in a nearby village and were back on base the next day. Ciburk’s biggest problem came after he survived the loss of his airplane. Each B-29 squadron contained 10 planes, with three squadrons in each bomb group. Ciburk’s group, the 98th, was one of three involved in bombing Korea. Two groups, including his, flew out of Yokota, Japan, and the third out of Kadena Air Base in Yokohama. He recalls that about 80 percent of the planes were serviceable at any one time. While on missions, Ciburk’s plane was sometimes attacked by anti-aircraft artillery, but never intercepted by enemy fighters. Because his father was dying, Ciburk was sent back to the US in August of 1951. Ciburk says he has sympathy for Vietnam War veterans, who were often met with ridicule upon their return to the U.S. By contrast, Korean War veterans were simply forgotten. Since the armistice, a demilitarized zone two-and-a-half miles wide straddles the 155-mile military demarcation line which separates North and South Korea. More than 2 million soldiers face each other on that line, making it the most heavily fortified border in the world. Provocations by North Korea continue to this day, their frequency and intensity varying with the status of the Cold War. This entry was posted on Thursday, August 27th, 2015 at 11:58 am	and is filed under Features, Top Posts. You can follow any responses to this entry through the RSS 2.0 feed. Both comments and pings are currently closed. We are very proud of our Uncle Charlie. All of these years we never knew everything he went through! He is a humble man!